ArcelorMittal Projects, ArcelorMittal Europe – Long Products Sheet Piling and Global R&D participated in a project financed by the Dutch government to improve the design of dikes and keep the Netherlands safe from flooding. The Netherlands is a low-lying country protected from the sea by dikes and dunes. For decades, dike reinforcements have been conducted to keep the country dry and prevent floods from happening. Due to continuously increasing safety demands and loads, one third of the Dutch dikes does not meet the required safety level. Macro-instability is one of the most common causes. It can occur when a high-water level pushes against the embankment. This causes saturation of the soil and loss of stability, resulting in big parts of the dike body to slide away. When there is a lack of space due to cultivation around the dike, reinforcements to prevent macro-instability are conducted with structures. Dikes with steel sheet pile walls are very strong and do not have to be widened, thus reducing the objections from residents and time-consuming juridical procedures. Given the big Dutch safety challenge, the urge for cost savings has risen the last couple of years. The government is making tremendous effort in search for innovations to accomplish these necessary cost savings. To investigate how the sheet piles design standards can be optimised, the government decided to finance dike tests in Eemdijk, in the province of Utrecht. The tests focus on gaining a better understanding of the interaction between the soil and the steel sheet piles. A team consisting of ArcelorMittal Projects, ArcelorMittal Sheet Piling and the R&D department contributed to the design process. 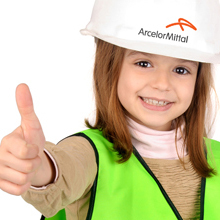 ArcelorMittal also provided GU8N and AZ26-700 sheet piles for the tests. They were produced by ArcelorMittal Sheet Piling’s mill in Dabrowa, Poland and Belval, Luxembourg. Amongst others, the choice of sheet pile profile in combination with the steel quality was crucial for a successful test. All dimensions of the sheet piles were extensively tested to ensure an accurate mapping of the profile characteristics. Additional tensile tests were performed to determine the exact mechanical features. This testing program is part of the Project Transcending Exploration Macro stability1 (POV-M), which is under the Flood Protection Program (HWBP)2. Likewise, the tests were gaining international level of attention; from US Army Corps of Engineers to delegates from South Korea and China. At the Eemdijk test site, an oval shaped dike of 5m high, 60m long and 40m wide was constructed in six months’ time. The dike was fitted with measuring equipment and was only used for this experiment which helps to increase the knowledge of soil-structure interaction. After the tests, the dike will be completely removed. A total of 3 tests have been performed at the site with our sheet piles produced in Dabrowa and Belval. Full Scale Test Green Dike: this part of the dike was constructed with a sand core and an outer cover layer of clay. The groundwater level inside the core of the levee was slowly raised to +2.80 metres, at which moment a sliding plane occurred and the dike collapsed. This test acted as a baseline measurement which was used as reference for the final test. Pull Over Tests: four different sheet pile configurations were installed 14 metres into the ground, after which they were pulled over with a hydraulic cylinder. 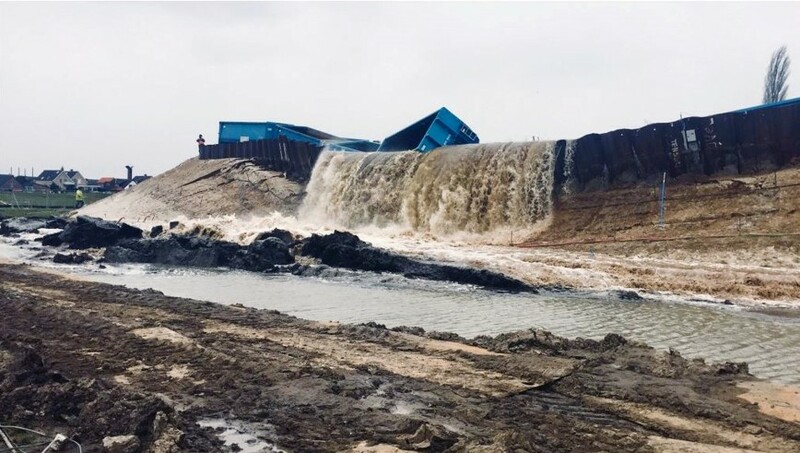 The objective was to see at which force level (with a maximum of 100 tonnes for AZ26-700) and which deformation the sheet pile wall collapses. Additionally, the four configurations gave insight in the differences in behaviour of a continuous wall and loose panels and between elastic and plastic behaviour of the steel sheet piles. Full Scale Test Blue Dike: this part of the dike was built similarly to the green dike, apart from the reinforcement over 60 metres with GU8N sheet piles. These piles were placed as triplets and staggered with lengths of 18 and 9 metres. This test was a combination of the above-mentioned tests and was the main test of the research. A 2-metre-deep ditch was dug at the bottom of the blue dike. The groundwater level in the dike body was slowly raised and the filling of water basin behind the levee was carried out over time. This led to a water level at the crest of the dike, located at +5m height. 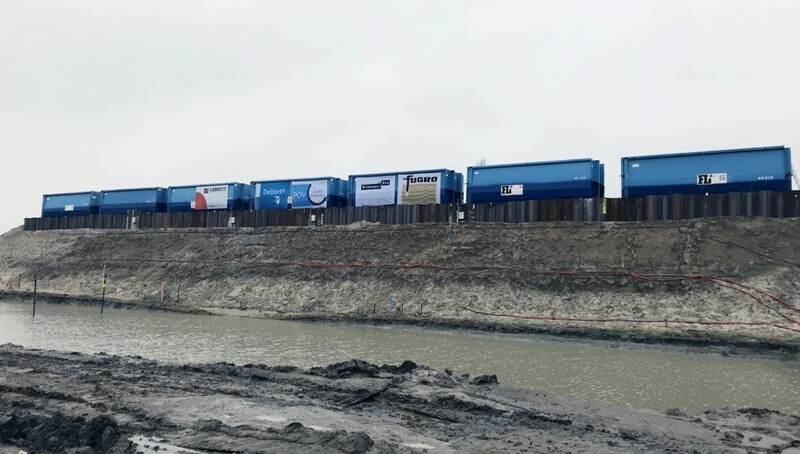 In addition, 7 containers filled with water were placed on top of the dike, creating an extra load of 40 tonnes per container. Despite the combination of huge loads, the steel sheet pile reinforced dike refused to give way. By infiltrating the landward slope of the levee and lowering the water level in the ditch, the dike finally collapsed. Two million litres of water flowed out of the basin into the hinterland; highlighting the success of the tests. The dike, reinforced with steel sheet piles finally collapsed but only after putting an extreme load on it; not collapsing the dike would have resulted in a less successful test. All results of the different tests were estimated by realistic predictions which are more favourable than the current calculation rules. This concludes that steel sheet pile walls are an extremely strong and practical solution for dike reinforcements. Existing dike reinforcement projects cost on average 15 million euro per kilometre dike. It is estimated that with the updated design rules, 20-30 % steel can be saved in new projects. With this envisioned cost savings, it is anticipated that the market share of the “innovated” steel sheet piles will increase in future dike reinforcements. 1 The sheet pile tests are executed in cooperation with Waterboard Vallei and Veluwe, Deltares, Witteveen+Bos, Fugro and ArcelorMittal. 2 A cooperation between Rijkswaterstaat (ministry of infrastructure and environment) and the water boards.